Air-Dampened Pallet Cushions. Easily attached to pallets or crates for shock and vibration protection. Made from durable and chemically resistant polyethylene. Available in a colour coded range to suit different loads (see list). Suits a 5/16-18 UNC or M8 bolt (also available without T-Nut). Pallet Cushion Spacer to Suits 6035 - 6225 Pallet Cushions. Allows cases without wheels or with removable wheels to be handled with fork lift or pallet truck. ShockWatch® 2 Impact Indicators are tamper-proof single-use, go/no-go devices that determine if fragile products have been dropped during transit or in storage. The indicators are not armed until activated by the user. The Warning Label fits over the ShockWatch® and shows what to do if the impact detection device has been activated. The TiltWatch XTR® is a single-use tip indicator used to monitor goods that must remain upright. It turns red if the package is tilted past 80°. However, it remains unaffected by movement due to normal handling conditions. The warning label fits over the Tiltwatch XTR® and shows what to do if the tilt detection device has been activated. Heavy Duty 152.4mm Padlock Hasp. 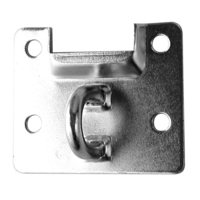 Medium Latch with Lid Catch Plate. For use with wooden crate panels 18mm thick.